Recently, the Durham District School Board engaged in a retro-commissioning study in order to identify potential energy conservation opportunities within the board’s schools. Through the study, they were able to pin-point many utilities related issues including excess utilities usage related to their fan-powered boxes. This led to considerable savings in energy. 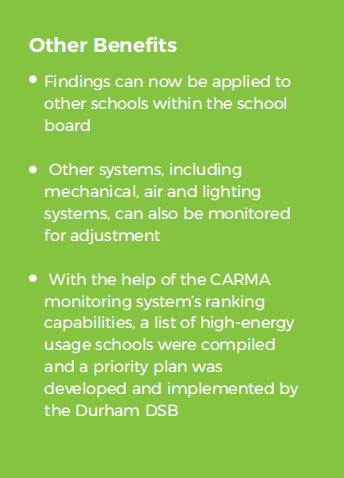 While re-programming the air-handling units as part of a retro-commissioning initiative, the Durham District School Board discovered that the fan-powered boxes at their secondary schools were not operating according to normal standards. They were running during holiday periods when the school was not occupied, 24 hours a day, seven days a week. 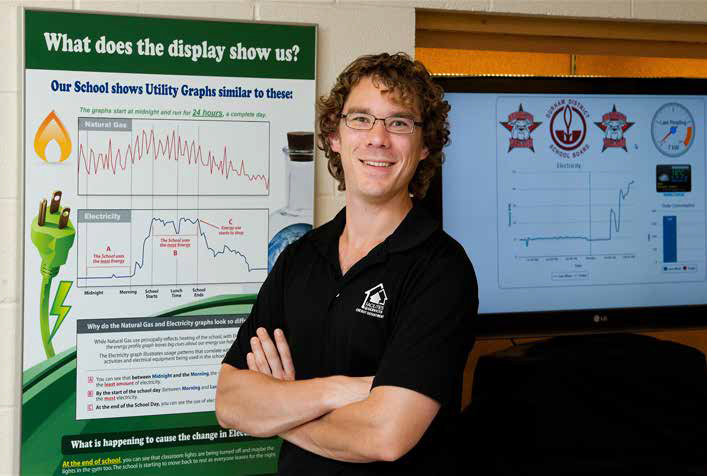 Empowered with this knowledge, Christopher Lambert, Energy Analyst for the board, directed the retro-commissioning project at Pickering High School to pinpoint the cause and resolve the fan-powered boxes issue. Lambert began by uploading a program and examining the programming logic, observing that part of the program had not been configured properly; he could also hear the fans continuously running. To learn how much energy was being used unnecessarily and to measure and calculate the energy and cost savings. Lambert turned to the CARMA energy monitoring system, which the Facilities Department had been using since 2006. 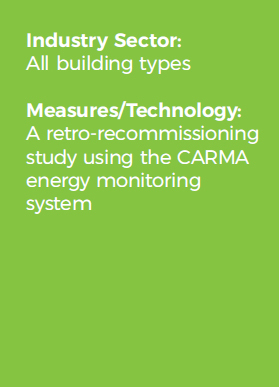 The CARMA system enabled Lambert to establish an average energy usage number pre-commissioning, as the baseline for comparison. Lambert then set out to reprogram the 45 fanpowered boxes, completing all the modifications in one week. "The advantage of having an energy monitoring system is the numbers are not theoretical; the data is real. This allows you to accurately measure real data, calculate and then project energy and cost savings." The results in electrical consumption was substantial. The average baseline usage before the changes was 70.49 KW, and the usage after the changes was 51.44 KW, a difference of 19.5 KW. From this data, Lambert was able to calculate that the fan-powered boxes used a total of 17.18 KW while they were running 24/7. The avoidable energy used by the fan-powered boxes totaled 138,056 kWh and the total cost of this usage was : $13,961.00 per year. In the future, Lambert, who has been with the DDSB for over four years, would like to make modifications to other mechanical equipment and conduct a post-report, similar to the fan-powered boxes study. Additionally, as the cost of water and gas increases, Chris sees value in exploring water and gas to diagnose and address inefficiencies that may exist. One of the biggest eye openers was the myth of new equipment operating more efficiently. Just because mechanical equipment is brand new and state-of-the-art doesn’t mean it is operating as efficiently as it should be. If equipment is not being controlled or commissioned correctly, it can be as inefficient as original outdated equipment. 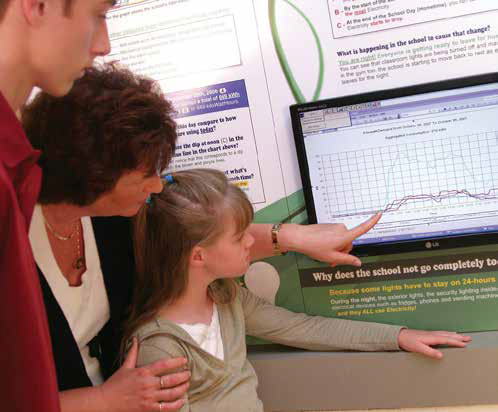 CARMA Submetering and Monitoring Systems are installed in excess of 1,000 Ontario Schools. CARMA Customers routinely confirm utilities savings of ten percent (10%) or more and system paybacks in less than two (2) years.